Jonnie was Mrs. Hinton when she married Joe. Joe became a Catholic after their marriage. Funeral service for Mrs. Esther W. (Johnnie) Sinton, 2105 Hercules Drive, will be held Friday at 1 p.m. in Evergreen Cemetery with Msgr. Michael Harrington officiating. Burial will follow in the cemetery. 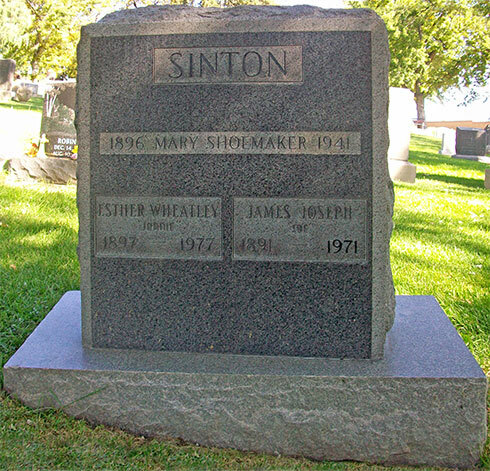 Mrs. Sinton, 79, was the widow of Dr. J.J. Sinton and had lived in Colorado Springs since 1953. She was a native of Snowmass, Colo., and taught school in Fountain, Colo., and in District 11 in Colorado Springs. She was a member of St. Paul's Catholic Church and the Dental Auxiliary Retired Teachers Association. Survivors include a son, Dr. Thomas Sinton of Colorado Springs; and two daughters, Mrs. Mary Jo Skeels of Littleton, Colo., and Mrs. Margot Petterson of Anaheim, Calif.